Baugh & Sons, founded in 1855, described itself as “the largest importers and collectors of animal bones in the United States.” Along with manufacturing plants in Norfolk, Galveston, Baltimore, and Oneida, NY, Baugh & Sons kept its corporate offices with its main production plant on the Delaware Riverfront at South Philadelphia Wharf #70, now site of the Pier 70 shopping center. The problem with mammal-based manure is that it’s very heavy, and so its use would be limited to what was available nearby. As an alternative, guano—bird excrement—was “potent, light and dry,” Johnson says, “but really expensive.” Much of it came from seabird-inhabited small islands off the desert coast of Peru, and that supply was pretty much exhausted by the 1870s. Eventually the focus turned to bones-based fertilizers, which are relatively rich in phosphorous. Johnson notes that in the 1890s, Chicago bone-fertilizer companies that were byproduct businesses of slaughterhouses began to surpass Baugh’s dominance: “Those meatpackers had tremendous amounts of bones,” he says. But by the by mid-20th century, phosphate beds had been discovered in places like South Carolina and Florida, and the production of fertilizer became a much more high-tech process, including the extraction of nitrogen from the atmosphere. Incidentally, the composition of phosphate beds comes from bones hundreds of millions of years old. In effect, using the phosphate is “delving down into time for a more potent resource,” as Johnson describes it. Hexamer General Surveys, as was their wont, published an incredibly detailed map of Baugh & Sons’ Delaware River Chemical Works, with one building labeled the “tallow rendering house,” a floor of another devoted to “store phosphates and dissolving tanks,” and several grinding mills. View it HERE. Then known as the Baugh Chemical Company, the company was purchased by Oklahoma-based Kerr-McGee Oil Industries in 1963. Kerr-McGee ceased to exist in 2006, when Anadarko Petroleum of Texas acquired their assets, further obscuring a once powerful Philadelphia fertilizer and chemical company. Where a tallow rendering house once stood, cyclists and joggers now pass through the southern terminus of the Delaware River Trail, entering a land of lumber, performance fleece, and rollback sales at the Pier 70 shopping center. 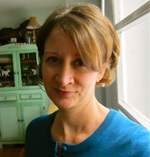 Formerly the editor-in-chief of Philadelphia City Paper, Theresa Everline has written for the New York Times, the Washington Post’s travel section, Next City and Preservation Online, and is a contributor to SmartPlanet.com. She usually says she lives in Manayunk, but it’s really Lower Roxborough, or maybe Wissahickon. I worked for the Philadelphia City Planning Commission in the late ’70’s – early ’80’s, a time when the Commission was producing a series of waterfront plans. I had worked on the S. Delaware Waterfront District Plan, when the waterfront was just starting to generate interest as a place to live. I recall visiting the Baugh site around 1982 with a group of NY residential developers, we walked out onto the site and it was completely covered with bones. Across the Delaware a car crusher was banging away. The developers did not return.